– To bid farewell to Ines Elvira, has been one of the most difficult moments in our 75 years of history. She dedicated 48 years to La Casa de la Madre y el Niño. She was not only the collaborator with more years of service, but also she was our best historian. She remembered all boys and girls who ran along our corridors, every name and surname, she had a memory of each child, she even knew the date they lived in the institution. She followed up every one who was adopted at La Casa, like a true mother does. Through correspondence she had an album for each child, she wrote comments and each story always received the same amount of love and dedication. Today those thousands of books with the pictures and history of our children, are the best testimony of her love, enthusiasm and dedication. Her life was Veronica her daughter, her grandchildren and La Casa de la Madre y el Niño. There was no way to convince her to take vacations, or a free afternoon. Her commitment, discretion, loyalty, constancy, sincerity, to the level of detail, are just some of her multiple virtues, that she generously planted till the last day in the corridors of our Institution. 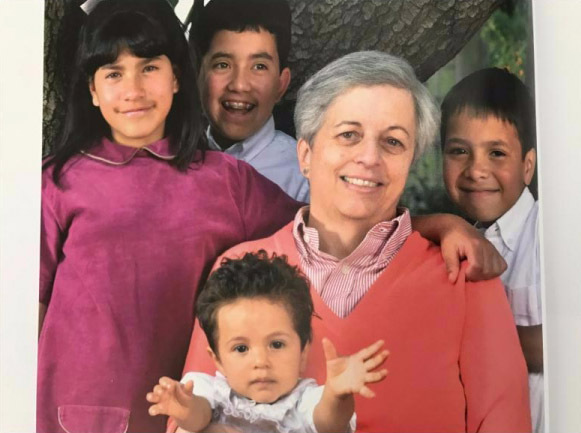 She was a dedicated mother and grandmother; nothing made her happier than being with her daughter Veronica and her grandchildren, speaking with them on the phone, receiving their pictures and sharing Lucas and Matias anecdotes. Her face transformed when she talked about her grandchildren, which filled her with absolute happiness. Her greatest pride always was Veronica, as a daughter, mother, wife, family member and professional, no doubt she was without doubt the motor of her life. Ines Elvira was more than a legacy for La Casa de la Madre y el Niño, and she leaves a big empty hole not only in the institution, but also in the heart of so many people who admired and appreciated her infinitely. Her entrepreneur spirit started with the great affection that our founder, María López, always had for her. She was the truly trustworthy person and the right hand to Barbara, our Director, whom always loved her as a sister. She had a very close friendship with Marta de Greiff, the total admiration of Maria Cristina de la Torre, two of our main collaborators during decades. She earned the love and respect of each of our employees, adoptive families and people close to La Casa, because besides her impeccable work, Ines Elvira never lost her calm or clarity in the most critical moments. The sadness and melancholy of saying good bye to Ines Elvira is not an easy task. None the less, knowing her character and impetus, what she would like most in this moment is that we honor her life with memories, smiles and anecdotes. Every milestone that we celebrate, we dedicate it to her, with the same enthusiasm, tenacity and perseverance with which she accepted each challenge and difficulty she faced during her lifetime. To Veronica, her husband Alvaro, her grandchildren Lucas and Matias, her sister Monica, her family and close friends our sincere condolence. Ines Elvira will always be in our hearts and we will continue to celebrate her life every day, because she left us a lot of teachings, memories and unforgettable moments. Dear Ines Elvira, we love you very much and we will miss you forever.